Los Angeles, California June 30, 2011 - GTX Corp (OTCBB: GTXO.OB), a leader in real-time two way GPS Tracking and personal location services (PLS) today announced its LOCiMOBILE subsidiary’s GPS Tracking Apps crossed over 1 Million downloads with users in 116 countries and continues to be on the top charts of iTunes and Android market place. 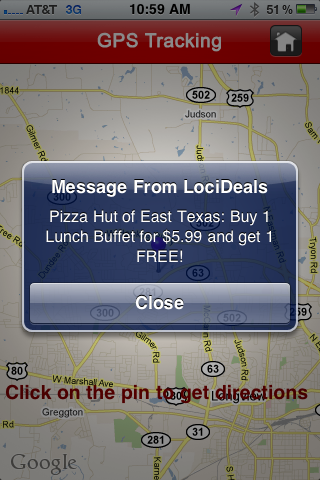 Looking ahead, the Company is continuing to expand its LOCiMOBILE ® proximity marketing platform and has recently partnered with MyChamberApp.com and launched a deal of the day for Pizza Hut a Longview Texas Chamber of commerce member. Kelly Hall, Longview Chamber CEO was recently awarded for best multimedia marketer through her innovative way of leveraging MyChamberApp and LOCi Deals push notification platform amongst her 1,000 plus chamber business partners. This week LOCi Deals were pushed out to thousands of local consumers for a buy one get one free Pizza Hut special. GTX Corp does not warrant or represent that the unauthorized use of materials drawn from the content of this document will not infringe rights of third parties who are not owned or affiliated by GTX Corp. Further GTX Corp cannot be held responsible or liable for the unauthorized use of this document’s content by third parties.